Grey Goose Farm -- Your Local Experts! Donnie & Stacey Whitmeyer started Grey Goose Farm because they love helping people create and maintain beautiful landscapes and gardens. 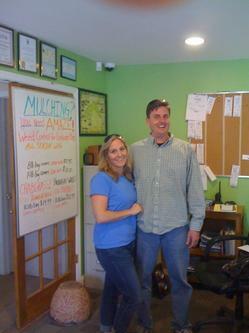 Donnie grew up in the Olney, MD area and Stacey grew up in Northern VA., so they both have local ties to this community. When the opportunity to buy this special property became available, the Whitmeyer's began the adventure of a lifetime! Grey Goose Farm is a small, family owned and operated business. On most days you will see the friendly faces of "Big D", Donnie's father, Donnie, and Stacey. The Whitmeyer family enjoys providing our customers with the best customer service, and we thank you for your continuing support. Grey Goose Farm offers products at wholesale prices for all your garden and landscaping needs: grass seed, plants, mulches & soils, pottery, hardscape materials, fountains, statues, and other decorative items both large and small. Come stroll down our Paver Lane which consists of over 15,000 square feet of patios, walkways, hardscapes, water features, fountains and statuaries! Customers love coming to the Grey Goose Farm because they can see what their patio or wall is going to look like before they purchase it. The Grey Goose Farm is a proud sponsor of WMAL's AM 630 hit show "Garden Sense." We also proudly promote the Turf Trust lawn care system. Thank you for taking the time to find out about The Grey Goose Farm. Browse our site for more ideas about beautifying your landscape!